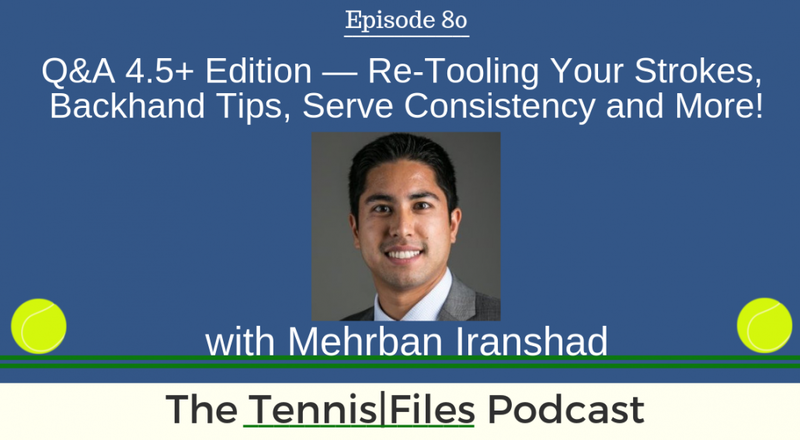 >> TFP 080: Q&A 4.5+ Edition — Re-tooling Your Strokes, Backhand Tips, Serve Consistency, Returning, Advanced Drills and More! I really enjoy receiving emails from my subscribers and do my best to answer them all (even if it takes a little while!). Thanks to you, your questions and the answers today will help your fellow tennis playing community become better players. Once again, I really appreciate every single one of you who has contacted me with your fantastic questions. I really hope you enjoy this episode! If you like the format, let me know in the comments below so that I can do more Q&A episodes in the future! And be sure to subscribe to Tennis Files below to receive the latest tennis content to improve your game straight to your inbox! Subscribe to automatically download new episodes! Click the icon above, click the blue "View in iTunes" button, then hit "Subscribe." Or hit the subscribe button in your favorite podcast app! Ep. 75 - Q&A Session — Anticipation, Fitness, Consistency, Technique and More! ​If you enjoyed this episode, subscribe to The Tennis Files Podcast in iTunes or your favorite podcast app! For more tips on how to improve your game, subscribe to my newsletter and download a free copy of my eBook, The Building Blocks of Tennis Success below! Thanks for listening!